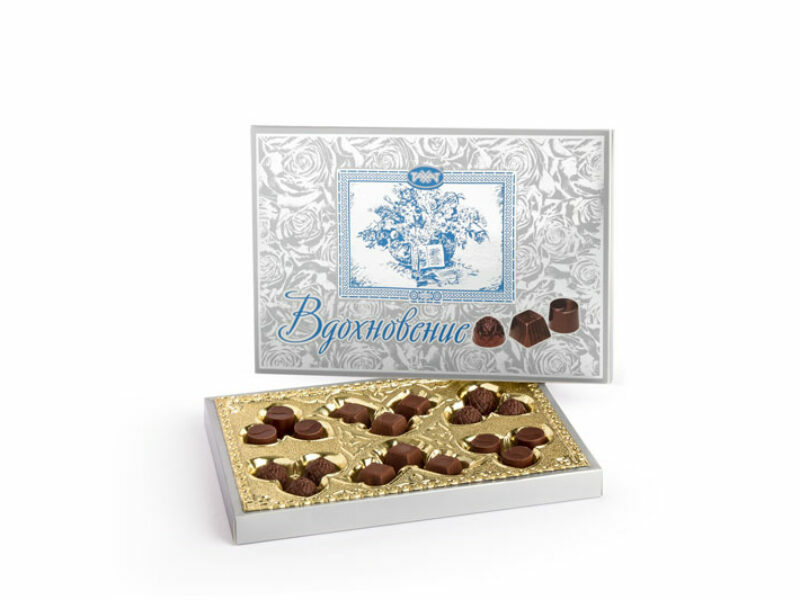 Chocolate candies with a filling made on the base of frothed whites of eggs with the addition of chocolate and with “coffee with cream” flavor. Chocolate candies with a filling on the base of white glaze and natural chocolate with the addition of crumbs of roasted almonds in sugar. Chocolate candies with a truffle filling. Ingredients: sugar, cocoa mass, cocoa oil, vegetable fat, glucose syrup, whole milk dried, condensed milk sugared, whey solids, almond crushed, neosorb is water-holding agent, cognac, emulsifiers: soy lecithin, Е476, Е492; egg-white dried, cocoa powder, common salt, gelling agent – agar; invertase is stabilizer, citric acid is neutralizer, aromatizers are identical to natural, vanillin is intensifier of taste and smell.